Discussion in 'Article Discussion' started by Guest-16, 19 Sep 2008. I saw this case a while back. £400 is quite a lot to pay but I guess you get a £200 case and a £200 WC setup. For what you pay for it it better perform well lol. I would still rather an NZXT Kaos with a custom water loop. Why not included chipset and/or videocard into the loop. On my own WC rig its a pre running a 240 rad for chipset and cpu and a 120 rad on the vidcard (from aqua-computer). With the 120mm fans being noctua's and the pump a Eheim. Its absolutely silence. The 4 samsung HD's in my system make more noise. I'd be interested to see what the performance is like when a high powered graphics card is added to the loop - do you guys have a BFG GTX 280 WC knocking around at all? Any chance of an addendum to include something like this? The manual says that the loop will happily cope with cooling a graphics card too, and you get more than enough spare tubing to accommodate this. Sorry for not mentioning this in the review, although switching the GFX card would have made our GPU stress test results somewhat meaningless. This is true, but then this case doesn't really directly compare to the other air-cooled cases that are tested in the same way. BTW, I never grasped the scale of the Asus Silent square pro until my friend got one for his P4 setup the othe day - it fills the rest of the space in his case! What's the point of using water cooling if you do not include at the least gfx card (and probably the HDs) in the cooling loop? If you want a silent system, that would be a must. When can we expect the new Antec in the bt office? test bench +desk fan = done! Seriously though, we've requested it, it shouldn't be too long. I definitely wouldn't try adding a video card to that loop with the pump pushing less than a liter per hour through the loop. My absolute lower limit on flow in my loop is somewhere around 3 liters per hour. Add in the fact that most video card blocks are quite restrictive on top of the sheer heat load a video card would add into the loop and you'll see that it wouldn't be in your best interest to try adding a GPU waterblock. The cooling performance is rather poor, 3C difference in cpu temp to the hyper osiris when idle and 4c under load, plus the gpu running hotter than a whole range of "normal" cases and that for 400Â£... sorry, but I'll have to call it a failure. You're not taking into account noise difference which is massive between any aircooled case on high and this on low. Plus, with respectively less airflow through the case the passively cooler graphics card is bound to heat up. 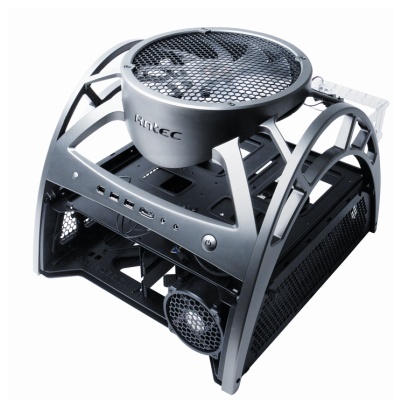 Zalman designs its products to be the right balance between noise and cooling, and this works very well to achieve this. There's one bit I don't really like : "four terabytes of storage (or soon more) – more than most will ever need.". Err... what? Aparently we'll be all dead in 5 years if Moore's law is to be believed( on the basis that we won't "ever" need more than 4 TB of storage OR more than 4 drive bays.) You can't assume we won't use more than 4 drives. What about RAID 50 / 60? This is bananas! Again Zalman uses the fin and tube style radiator. Why don't they use the more efficient automotive style radiator? The thick aluminum is nice, but I'd rather have a better radiator and quieter fans. To be honest, given the price I'd rather get a Koolance Lian Li case. Vastly superior cooling, for only a little more outlay. Plus the Lian Li cases are more spacious albeit at the expense of super-thick paneling. He meant right now, that's why it had in brackets "(or more soon)" - in time hard drive density will grow allowing bigger capacities, but without additional cooling I wouldn't want to cram more than four in to be honest. but thats just me and my poor wallet.